I have heard a lot of bad talk about Shopsmiths. Mostly by people who heard it from someone else who heard it from someone else who heard it from someone else. And mostly by people who have never even seen one, let alone used one. A Shopsmith is a complex machine. Get the instruction manual and learn how to use it. I own several and I own a large amount of the options and accessories for a reason. They work and they work well IF YOU KNOW HOW TO USE THEM. If you do not know how to use them, they generate a lot of saw dust. A Shopsmith is the best lathe I have ever used and I have used numerous lathes other the years. Check out YouTube and see what some of the postings about Shopsmith are. Doug Reid has a YouTube Channel with a lot of good Shopsmith postings. My Dad had a lot of quality tools that, as kids, we tore up. Never saw Dad get mad about his loss. One of the losses was a special set of open end wrenches designed to adjust the mechanical valve lifters on L-head six cylinder engines. They are very thin. We used them to take off and put on the wheels of our bikes. They were not designed for it and were ruined. I still have them. Certain tools have a lot of meaning to me. I have his Rock Island Vise and had to jury rig it to mount it, missing the special pivot bolt. Memories. Some are simply tools. Bas, a former employer and excellent woodworker, sent me some information on Bad Axe Tool Works. Okay, I am a bit sensitive about names. NOT WHAT YOU MAY THINK. It is the geographic area, the Bad Axe River, of Wisconsin in which the company is located. Colonel Mark D. Harrell, United States Army, Retired, is the owner / president. I spent hours reading about saw construction and use on his home page. I watched my Dad hand sharpen some of his saws after we ran them into nails and whatever else. He was good at it. Anyone who can explain saw construction and sharpening desires the Nobel Prize in Toolmanship. I tried hand sharpening a saw the local saw sharpener would not touch several years ago. It got better, it was not good when I got done. So, I ended up with a Bad Axe saw and Bench Hook Set which I must thank the Colonel for. My first task with the set was the trim for the Murphy Bed project later on this page. I have always hated miters. Most people do not understand that a four-sided square or rectangle with 45 degree cut corners is eight angles working together. A little off on any one of the the angles or the length of any one piece of wood and the project is way out of alignment. The Murphy bed needed something to break up the 57" wide by 77" inch face of the drop-down section. It was going to be molding / trim. God is Great. God is Good. God is Timely. I am thankful. The Bad Axe Saw and Bench Hook Set showed up. Sixty-four pieces of trim, with a 45 degree angle at both ends. The results were SUPER! While every meeting is not perfect - my lack of skill, the vast majority are superb. The angles match extremely well. The saw is a perfect fit for my hand. I have several miter boxes. Most are dust covered and abused. The Bad Axe Bench Hook Set is beautiful. Kind of hate to take a saw to it. So I used a sacrifice soft wood - paint stir sticks, to protect the Bad Axe saw and the Bench Hook Set. The cuts are true 45s and true 90s - another small project. The saw is smooth cutting through the clear pine. The handle is extremely comfortable. Due to the stupid auto accident I could only cut about four pieces before I had to take a break for a while. During the breaks I sat there thinking about Dad working with wood in our basement. Memories. The Bad Axe Saw and Bench Hook Set is phenomenal workmanship and quality. They brought back many memories and provided a greatly appreciated quality to my work. While I classify myself as a woodworker, I do not classify myself as a master woodworker. 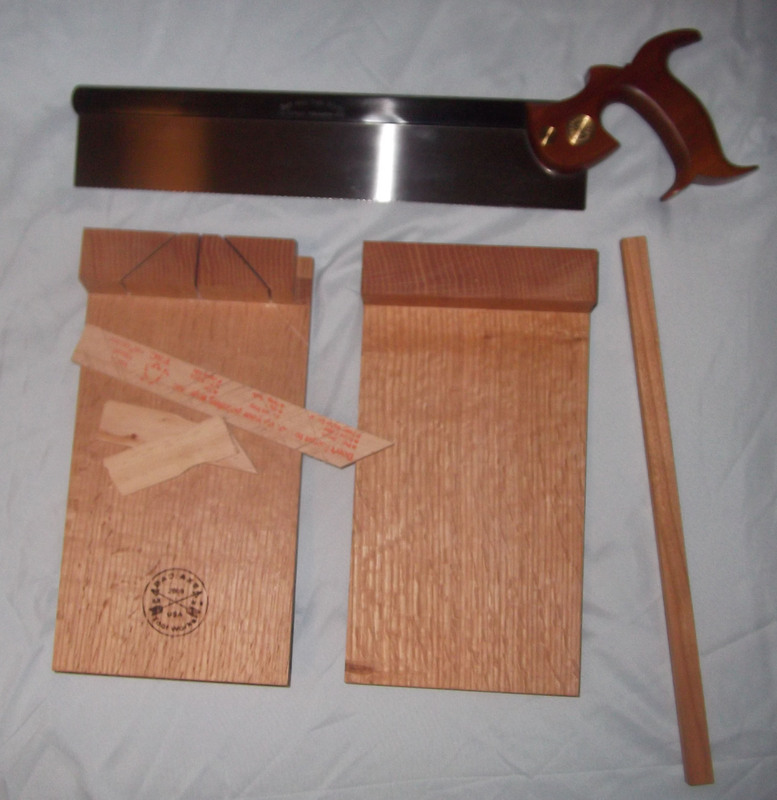 Here is the Bad Axe Saw and Bench Hook Set. The sacrifice pieces are there. I really hate to mar this quality and presentation. Storage will be in my reading room / guest room. Not going to let something like this live in the workshop. These are eight pieces of trim meeting. These two are representative of all of the trim joints cut by hand with the Bad Axe Saw and Bench Hook Set. I will admit a few of these complex meetings are slightly less than perfect. However, those are VERY VERY nice. My skill level. Dimensional lumber, those rectangular 2x4s, 1x6s, etc, come from round trees. Cutting square or rectangular lumber out of round timber does not consume the entire piece of timber, a cut tree. There are leftovers due to shape, size, quality, or other factors. These get sold cheap - not a lot of man-hours or equipment time involved - to secondary users. Some of the purchasers are the growers of plants headed to the U.S. These plants are low value products and the goal is to not significantly increase their value through packaging. So these growers purchase these leftovers cheap. When the mill sells these leftovers they "repurposed" that wood to the the growers for some cost recovery. So I refer to these leftovers as "repurposed lumber." The growers make frames or racks, shown in the background of the photo and send their plants to the U.S. These frames (I will stick with "frames" from here on out. ), may not be "standard shipping pallet" size of 40"x48." The frame in the picture is 40"x42"x24". Some frames may have a standardized shipping pallet as its base and may be 72" high. Upon arrival the frames become leftovers for the commercial greenhouses. The commercial growers are going to ship their much larger product out in cardboard boxes. They want the seedling plants. So, trying to recover some of their costs, they usually sell these frames or racks for as little as $5 each regardless of size, condition, or contained wood. For that small fee, they will generally allow you to plug your extension cord into their power source so you can cut the frames into transportable pieces with your reciprocating saw. If you can transport assembled frames off their property without creating a hazard, maybe you have some bargaining power on price. As a user of this wood you have no idea what you are going to get. I would make this general statement after several years of dealing with repurposed/recycled wood. 30% is going straight to the fireplace, 40% is going to be "standardized" with a planer and jointer into pieces with a thickness of approximately 1/2" and widths not exceeding 2 1/2" with lengths usually in the 36" range. 15% is going to be "standardized" into thicknesses of approximately 3/4" with widths not exceeding 2" and lengths of approximately 36". 10% is going to be standardized into 1 1/4" x 1 1/4" with lengths varying from 20" to 72". These pieces are coming from the corners. The remaining 5% comes from the bases and will "standardize" into 1 1/2" x 3 1/2" with lengths up to 40". The way I work with the corner pieces is to use a screwdriver and a hammer, split the "hanger on wood" with its grain. Then I place the corner piece in a heavy metal working vise held by those annoying spiral cut nails. Once mounted, I let one of my son-in-laws prove how strong they are, and pull the piece off leaving the nails in the jaws of the vise. Note: You have to inspect the nails to make sure none have broken off in the wood. Note: The planters favor spiral cut nails so these frames stay together. And they do. Trying to knock them apart with a hammer will break and split the wood reducing your usable yield. What you are going to get? You are going to get repurposed, recycled wood. It will be random thicknesses, random quality, and random species. Lose knots and knot holes will be common. It will have nails, usually spiral cut, "office staples," and poultry staples in it. You are going to get leftover mesh and cardboard. So each piece has to be inspected before running it through a planer, a jointer, or saw. What can you make from it? Anything you want. A number of my projects are made from this wood or contain pieces of it. The boxes made for Christmas 2014 have some absolutely beautiful grain showing. I love working with my hands and love working with wood or metal. In 2011 I finished a workshop project that gave me a 24' x 30' x 9' workshop. The workshop was a dream since 1987 when we moved in. The nine foot interior ceiling means I just need to lift the wood a bit higher to hit a light. The apron and the walk around walk are just very nice touch-up details. 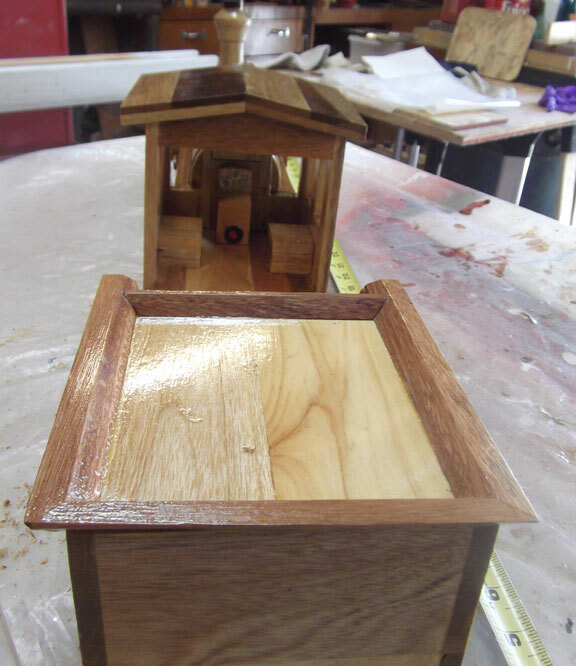 One of the first projects in the workshop was a jewelry box for Joyce. I am lucky. Joyce is not a big fan of jewelry so this holds mementos of trips and events. By the plans and pictures in the magazine were neat so .... this is what I ended up with. I have been a member of the San Diego Fine Woodworkers Association for years. They are obvious not picky about member skills or membership. One of their "privileges" is to supply the materials and then let you invest hours in completing the project. The item is then donated to places such as the Children' Hospital. 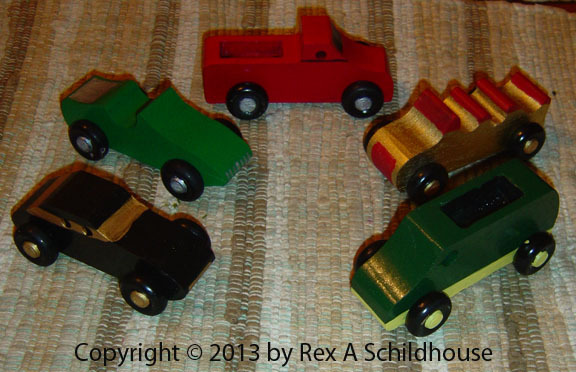 I love their car kits and these are some of the twenty-four cars and trucks for a recent Christmas donation - 2012? Those on active duty and who have completed their service are both Veterans. I utilize the Naval Medical Center, San Diego "Balboa" and Department of Veterans Affairs Medical Center La Jolla (San Diego) too much and generally do not enjoy what I see. I make two things to help out. The first is the lap desk. There is nothing complicated or hard about it. And it is very light being out of 1/4" plywood. Use it for crossword puzzles, write letters, put it on the carpet and build a Lincoln Log Cabin, put a computer on it, serve a meal on it by placing a damp paper towel on it, use your imagination. One of the "improvement" features was I started putting a slot in the ledge board to stop papers from sliding / curling off. I usually carry four or five in my car. I have seen them used as frisbees out of frustration. They work only once for that purpose and fly rather poorly. The other item for Veterans is a special build item and I have only made a few. The chair desk is designed and fitted to a specific Service Member or Veteran. The width of the chair, the angle, etc. are all specific to that end user. While this prototype and measuring / fitting example has the drops cut off each end, the delivered product has drops on the ends so the chair desk will not slide left or right and then off the chair. And for the bedridden, the risers keep the chair / bed desk off the legs. On Palm Sunday 2012 one of the members of our Ramona Valley Presbyterian Church asked if I could look into repairing the Church's pulpit. 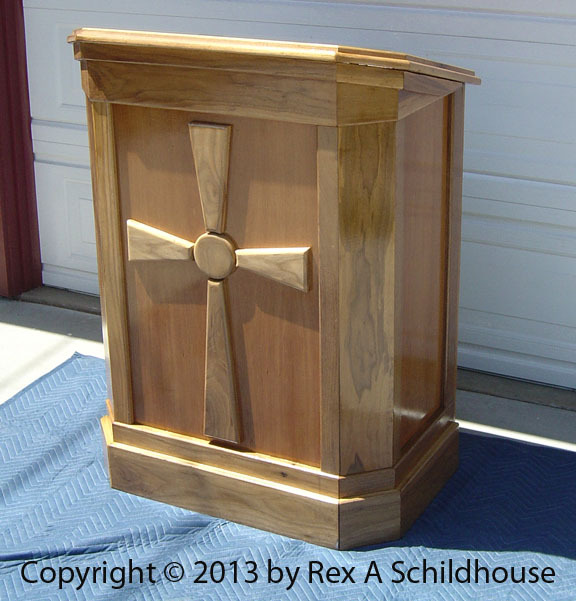 We meet in a community center and the Pastor had been using the worn out and beat up podium. Upon delivery on the Monday before Easter when I saw what I had coming my way my response was "I can look at it." It was in something like four major pieces and seven minor pieces. This was not a repair, it was a rebuild. Joyce and I worked on it for probably forty plus hours and put something like seven coats of finish on it. We put it in the HHR Saturday evening before Easter. We put it in front of the congregation Easter Sunday for the first time in a while. Not bad. Whomever built it used some super woods in its construction. The Shopsmith is a super lathe in many aspects. You can change the speed as you go without a shutdown and restart and with smooth speed transition you get the EXACT speed you want. 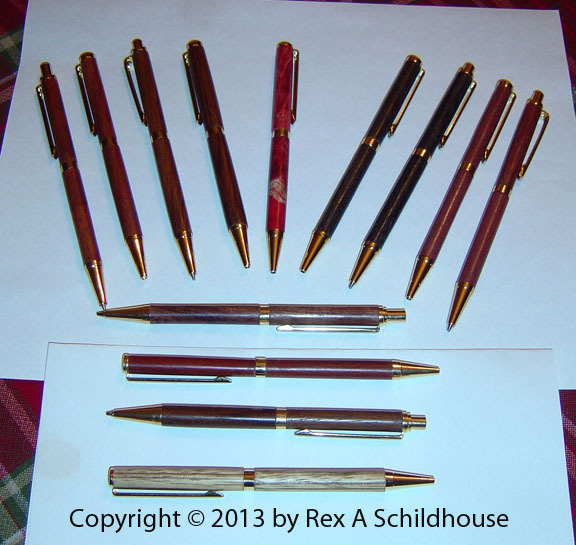 I love turning pen and pencil sets and we give a lot of them away for Christmas and special events. 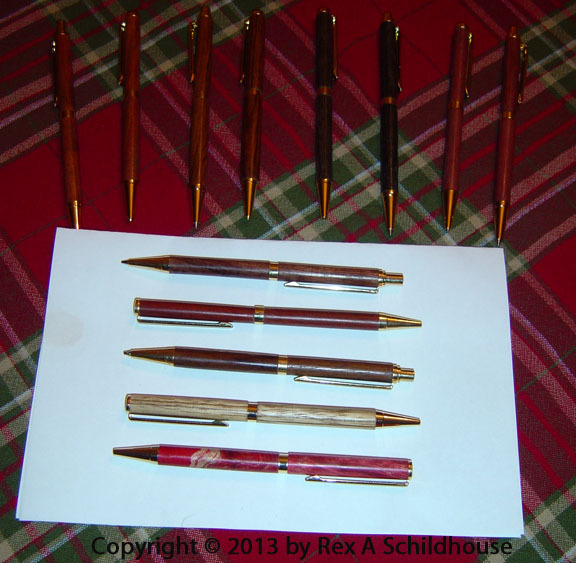 Here are some of the pen and pencils for Christmas 2012. I think I made something like 72 sets during the year of 2012. Stools are always an issue. 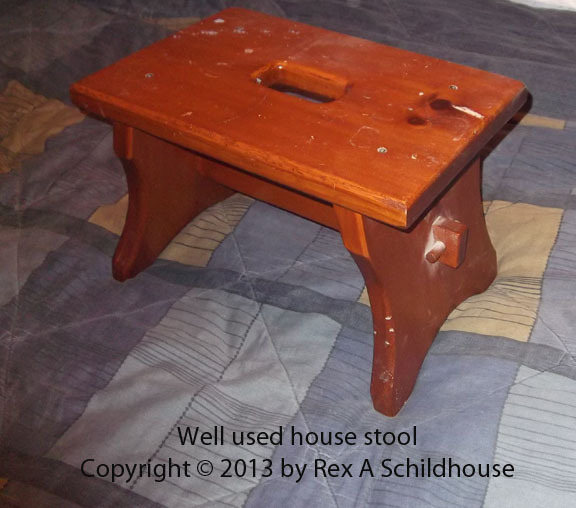 The right sized stool gets a lot of uses and I made a lot of these for our local senior citizens' center several years ago. We debated features with every prototype and I kept all the prototypes. One of the comments was they did not look very sturdy. So I jacked up my 4,400 pound 1969 Chevy C-10 pickup truck and put one under each tire. Several people pushed and pulled and nothing moved except the sweat on their foreheads. These stools move around the house and get some pretty heavy use. Here is one of the banged up and well used stools. In our move to Japan in the late 1970s on Navy orders I brought over limited power tools. That allowed me to complete numerous small projects. Then we found out we were going to be parents. My Brother-in-Law Brad, copied some plans he had found in a magazine and sent them on (before the Internet). Fortunately the MWR (Morale, Welfare, and Recreation) organization has facilities to reduce boredom. I purchased some really beautiful Japanese Redwood and went to work using their big tools table saws, band saws, planers, jointers, whatever. Part of this design is the cradle flips over and using the pad from the cradle side, it becomes a bench. All three of our daughters came home to this cradle and it has been flipped into a bench many times and the girls loved it. 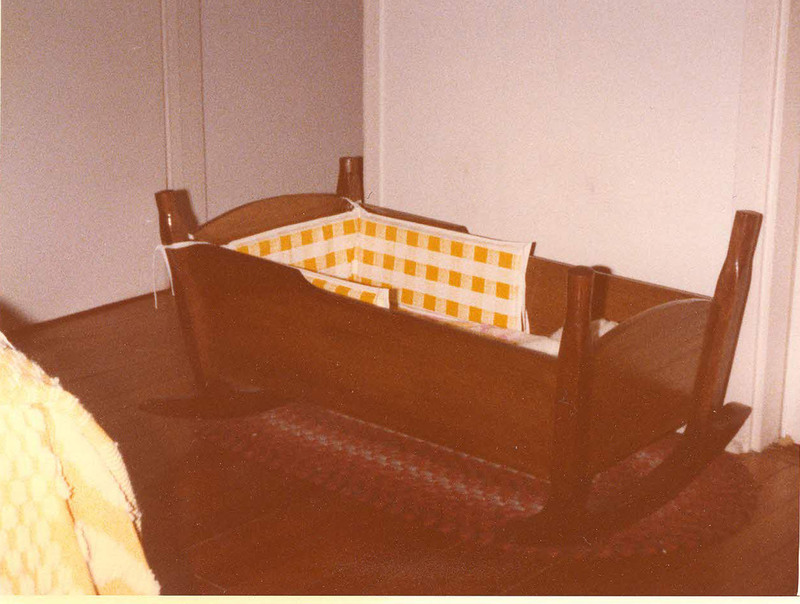 Right now, thirty-five years after it was made and after it has moved through more than ten duty stations and through more than fourteen houses this cradle is in our little bedroom awaiting a grandchild. Our children are long past the days of sitting at the dining room table and doodling on paper with crayons. One of our holdovers was a large roll of "printer's paper" used with some drawing boards long gone. Thinking that Joyce's elementary school could use the paper I went and talked to Chris, the principal. 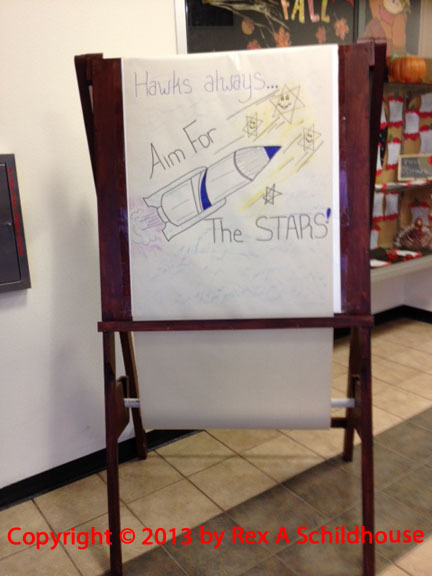 The conclusion was that the school could use a message easel in the entry way. Okay, had the project vision and construction started. The final product is shown here. The roll of paper is on an axle holding it in position so it rolls easily but not too easily. There is a slot in the pen trough so the pens are in front of paper and the paper is always flat on the board. There is a take-up axle on the back near the top so the paper is always held in place. Placing the heavy roll low keeps the center of gravity down. And, there is a spacer between the legs to reduce the probability of creating a pinch point. This concept of feeding from bottom to top allows a continuous message or text to be written without tearing the paper AND, it can be reviewed in the order it was written. Very stable and a lot of fun to build. First, before we start an argument, I believe in Christ and in Christmas. This is a "Merry Christmas .....Sucker Tree," not a "Merry Christmas Sucker ..... Tree." Rather than increasing some store's profits and the profits of some chinese (lower cased out of [lack of] respect) company, I make things for presents. I tell my Wife and Children that the greatest gift I can get for any reason / season is a list of what they want made in wood, metal, or just about anything else. I saw a version of this sucker tree in an office so I played with it. My Wife likes the red / green combination, I love the natural wood grain presentation. And with the natural wood grain you can make is a tree for all reasons / seasons by supplying different tree aprons or skirts. 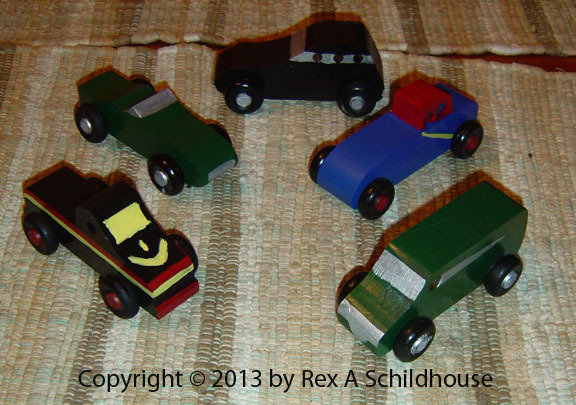 All of these are made out of repurposed / recycled wood. They are designed to be laid flat in storage. The top and bottom branches are glued in place while the others rotate freely. This keeps the tree together. Clue: If making this project, drill the sucker stem holes at an angle. This is a great project for five-year olds so it is right at my skill level. When we purchased our house the contractor had built the kitchen with the "standard at the time" over stove top vent, electric stove top, and dual electric oven / microwave. The twin unit electric oven / microwave was an "apartment sized" unit about 26 1/2" wide. After a lot of use and service things started to die. So we toured numerous stores and saw a number of models. None fit our sizing needs or design desires. A commercial builder gave us an estimate that was a significant percentage of our annual income and an estimate of eight weeks to completion. So... pull out the tape measure, scratch paper, and brain. What we ended up with an over the stove microwave / convention oven with an integrated vent. The stove is dual fuel - propane gas range and electric convection oven. So cabinets came out, things got cut, things got reinstalled after adjustment and some stuff was totally new. And it was less than a month's income and took about five total days. The top left picture is the old arrangement for the stove top and vent. 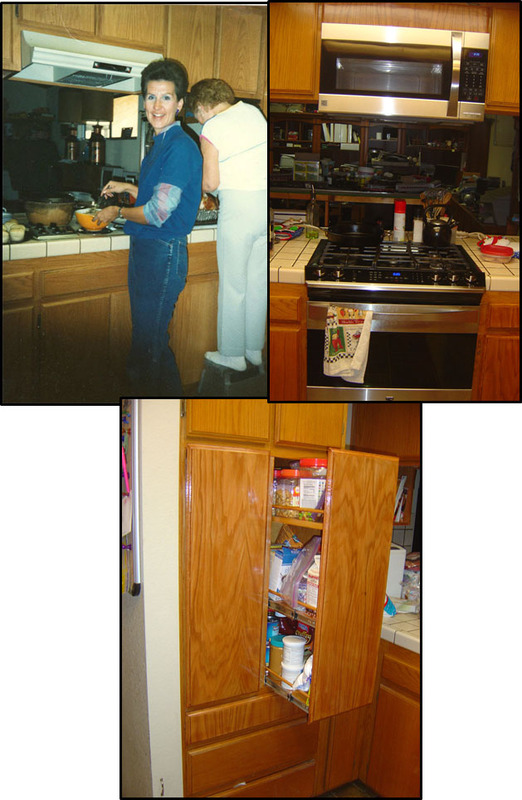 The top right picture is the new microwave / convection oven / vent that replaced some useless cabinets. The dual fuel stove replaced the electric stove top and several other cabinets. Now the issue was, what do I do with the hole caused by the removal of the 26 1/2" wide microwave / electric oven unit? Following the plan we installed a "pantry." The shelves are approximately 12" wide and about 14" high between shelves resting on four full extension ball bearing drawer slides capable of holding A LOT OF WEIGHT. See the results in the bottom photo. The dowel rods keep everything on the shelves. To prevent problems the interior of the cabinet was finished / filled smooth to eliminate the possibility of a pull-out getting stuck in. We gained a 4 1/2" deep, 27" wide, with a depth of over 28" drawer below the pull-outs. Great for splash guards and such. This drawer is also on full extension ball bearing slides. The difference in the woodwork coloring from old to new is the result of totally refinishing the kitchen with Min Wax Polyshade Golden Pecan the year before. A very durable finish that really brings out the beautiful grain of the red oak wood. A side effect of this project was the original kitchen was totally electric. In our rural area electric outages are not totally uncommon. Now with the propane gas stove we can still cook. We have had about eighteen power outages in 26 years, I just love cooking on gas. Our barbecue is about 20 feet from the kitchen and with a low at night of 30 degrees ABOVE zero as "COLD" for our area, we BBQ twelve months a year. 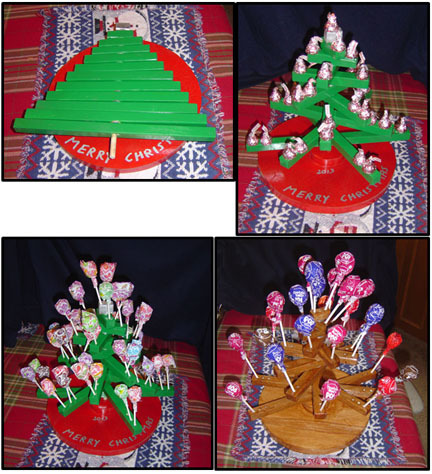 This tray was made for Joyce's Christmas 2013 present. The company I work for 7-4 gets a lot of product in frames made from mill cutoffs. The repurposed / recycled wood is whatever from South America, Central America, and Asia. I hate seeing it got to dump so I recovered a fair amount of it with some projects in mind. The Merry Christmas Sucker Trees are from this same wood. 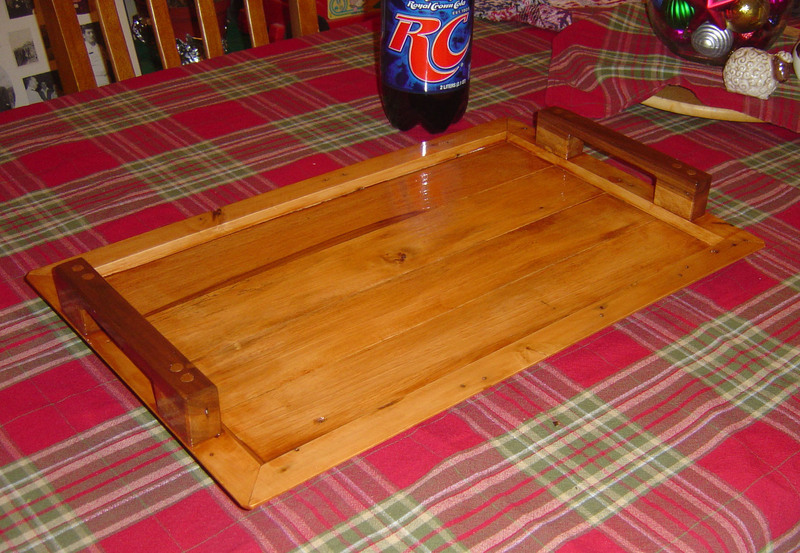 This tray, two-liter bottle for size, is amazingly light in weight and has no nails or screws. Dowel pins are used throughout. The repurposed / recycled wood has some really beautiful grain which does not show well in the photo. Shortly after I retired from the Navy Joyce said she wanted a pair of corner cabinets for the dining room. This would "round out" the room by filling the corners. The end result was two matching corner cabinets, this is one of them. A lot of fun to build and figure out. The back is at a 45 to each wall to "soften the corners." The top crown molding is set so things cannot slide off. There are a lot of dowel pins in this project. If you did not figure it out we collect cups and mugs from our various trips. 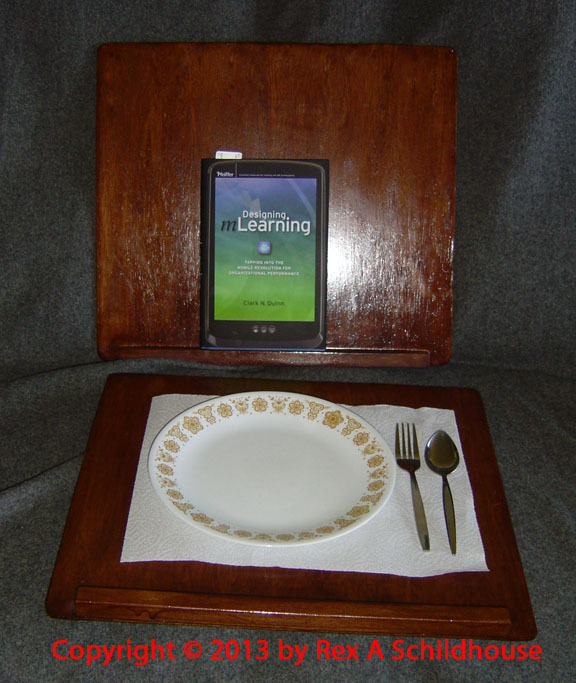 The plate shelf was another "Can I have a" request for some special day. I love those requests. Somewhere along the line we filled the corner cabinet shelves with our numerous souvenirs so the request from Joyce was a plate shelf. This is approximately thirty-eight feet of oak shelf that covers four of the five walls in the dining room. 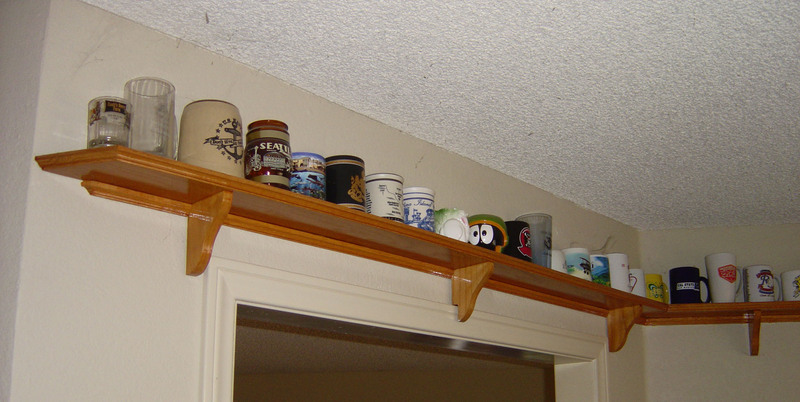 They are full with cups and mugs from all over the world as well as some special interest or subject mugs. As our daughters went off to college dorm furniture became an issue and moving FREQUENTLY became an event - AGAIN. Our oldest daughter wanted a shelf to fit into a small dorm room and this was the result. Even though it never actually made it into the dorm room. To go with the shelf there is a matching desk. The construction of both dictated several things which included transport and assembly issues. Both the shelf and the desk assemble and knock-down without tools and both lay flat in transport. Through the use of angles and dowel pins the furniture is very stable. 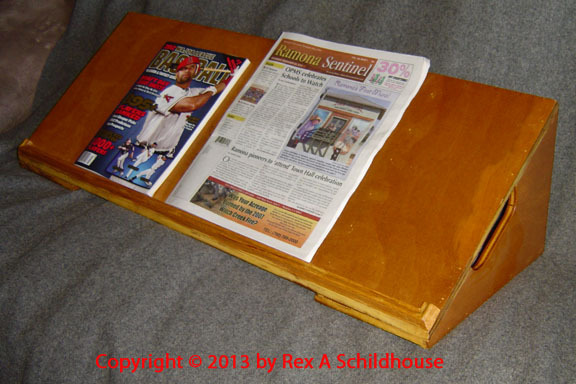 Both the desk and the shelf have moldings to preclude things rolling or spilling off the sides or back. The desk ended up in a bedroom holding a 20-gallon fish tank. That is over approximately 160 pounds of water. My oldest daughter's birthday was coming up and my wife made a suggestion based on some "service" needs during family get-togethers that she hosts at her house. It was another issue of I was going to get to make something. I love those types of issues. I have a pile of repurposed / recycled wood. This tray is also a Lazy-Susan. The only metal in the tray is the turntable. The turntable is held to the base and the tray with wooden axle pegs. The corners are splined to retain shape and add strength, they are barely visible in the picture. The handles are dowel-pinned on with cross dowels for integrity. Very light and very stable with a service area about 18" across and a wide base of almost 17". The finish is several coats of Indian Mahogany Min Wax Polyshade and then a couple of coats of Min Wax Gloss Polyurethane for depth. 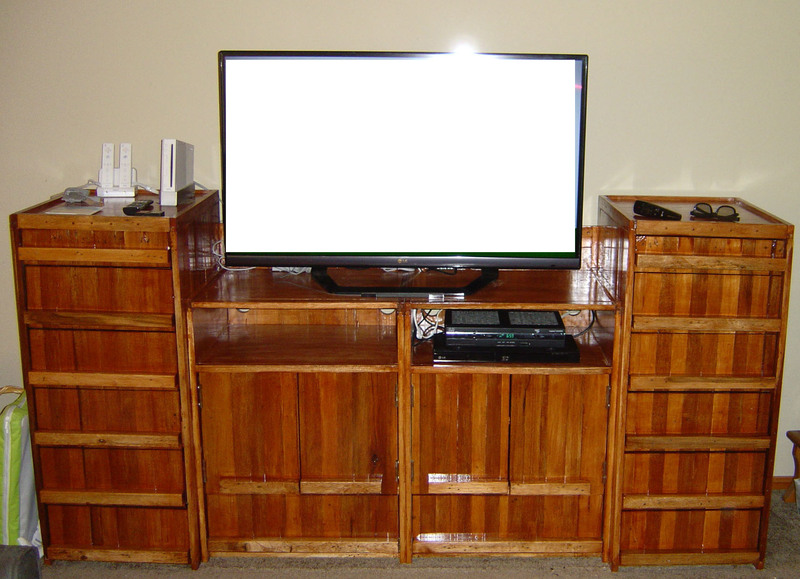 I built our previous entertainment center while we were stationed in Kingsville, Texas in 1980. It was designed and built for the enormous and heavy electronic components of the time with the massive components of 2x6s and 2x8s as vertical components and 3/4" plywood as horizontal components. As designed, it sustained nine Navy moves two moves between the U.S. and Japan and three transcontinental U.S. moves without major incident. At my 7-4 job I had the opportunity to get repurposed / recycled wood from pallets and frames which contained materials from all over the world. I cannot identify wood and actually do not care to. I select wood for beauty and use. I also had a lot of odd size leftover wood in the shop from other projects and those leftovers also got utilized in this project so no "prime wood" is utilized in the entertainment center. One drawer bottom is the assembly of seven pieces of wood while numerous others are constructed from six pieces. A couple are actually from only two pieces. Most of the drawer slides are Blum slides from an an earlier projector, also leftovers, so only a few drawer slides were purchased. The only metal in the project is that associated with the drawer slides, drawer pull mounting screws, the furniture bolts holding the four modules together and hinges. The project consumed over thirty feet of dowel rods converted into 1 1/2" dowel pins and over 300 #20 biscuits as well as almost three quarts of glue. The only materials bought for this project were some of the drawer slides, the furniture bolts, and the Min Wax Pecan Gloss Polyshade. This is the end result. Started as in December as a Valentine's Day gift in 2013, ended up closer to our forty-second wedding anniversary in June 2014. It is simply impossible for me to sit in a waiting room for an appointment of any kind. So I carry books or puzzles with me at all times, just in case. A couple of years ago Rockler Woodworking had Sudoku kits and a drill template for the board. I played with several different layouts and tries and then hit on this one. 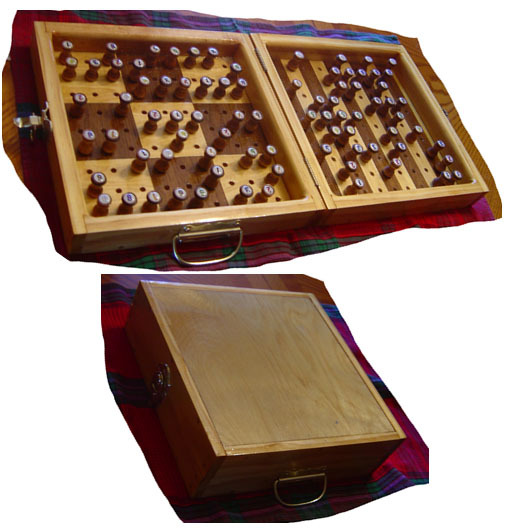 The box is about 11 x 11 x 3 inches closed and about 22 x 11 x 1 1/2 inches open. The hinges, hasp, and handle allow it to be closed, locked, and carried with spacing allowing the number pegs to be placed anywhere on the board without interference. The pegs are just snug enough to remain in place during transport and just loose enough to be pulled out with ease. If you are following a Sudoku puzzle the "given" positions can have a black O-ring on them to indicate they are not movable. In the photo, the left side of the board is the playing area. The right side is the holding area. Each alternating strip starts with 1-9 numbers on it helping you solve the puzzle by placement. 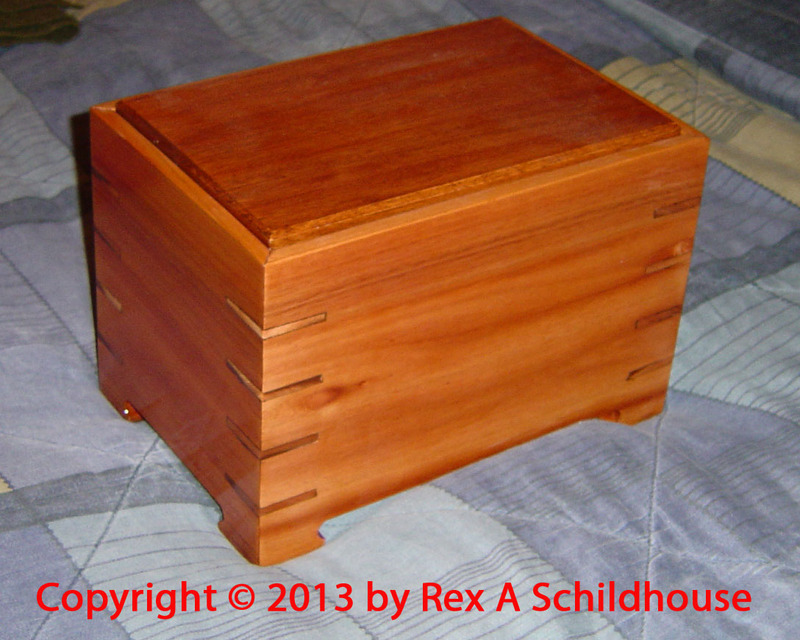 The box itself is made from clear pine and the top and bottom are 1/4" clear pine plywood. This is my first project with veneer. It was interesting and an experience. The veneer was cut with a veneer saw using a steel square as a guide. With the veneer on top of the plywood the drill put a needle hole through the plywood. On the playing side, the cut pieces, light and dark, are close to perfect squares. On the holding side the strips were cut into almost perfect rectangles. Placement for gluing was not a problem. Using wax paper and about fifty pounds of deadweight, I pressed the veneer surfaces until dry. Sanding was not a problem with fine sandpaper. Drilling was done before the boxes were assembled. For drilling the boards were covered with wide painter's tape to reduce tear outs. With 81 holes (9 x 9) on each board, drilling took several days due to a medical condition caused by a (NOT MY FAULT!) auto accident. Once drilled assembly was pretty easy. Pins rather than nails or screws are used in all the corners. With the two halves assembled but not joined the pieces received four or five coats of Min wax Polyurethane with sanding to bring the grain down or to break the previous coat. Final assembly of installing the latch, hinges, and handles and it was done. Fun to use, fun to tote around the house. Not sure I would carry it into an office to solve a Sudoku while I was waiting so it is for home use. I love working in wood, I love working with my hands. I get repurposed / recycled wood from a former employer, a commercial greenhouse, for helping out with some issues as I can. I love the natural grain and variances in real wood. 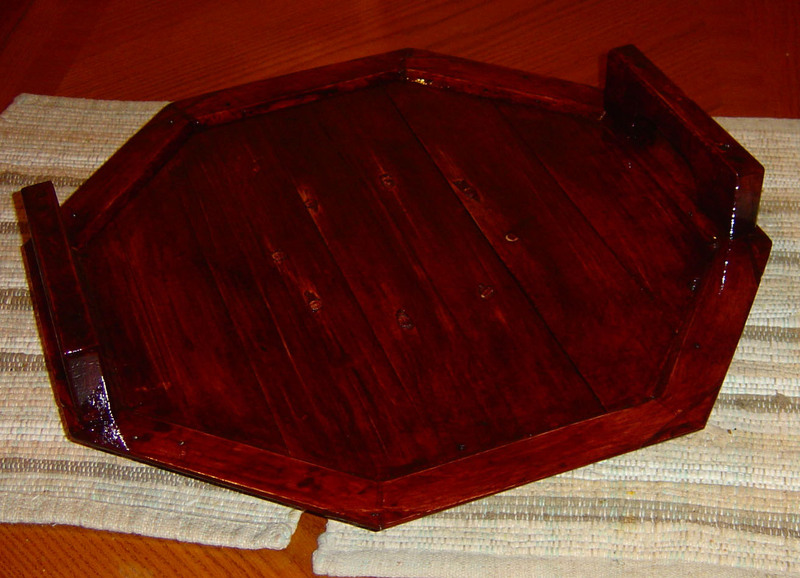 Because these are repurposed / recycled woods, so there are nail holes, knots, knot holes, and dents in some. Part of real life. The boxes are built to consume the most possible materials after planing and jointing the repurposed / recycled wood. So no two boxes are the same size. One end or side of the box has the internal ledge beveled so a press there will pop the lid up for opening. Some boxes have rabbeted corners, some have notched ("box joints"). The Min Wax Polyshade really brings out the grains nicely. My second daughter and her husband have five dogs. They decided they wanted to make a "Dog Paw Print" of each of their dogs as an item for their home. So ... off to work based on their desires. Each "cell" of the box is 5" x 5" x 2 3/4 inches. You can see the stringers across the box. These are there to hold the Plaster of Paris in the box. All of the wood except the stringers is recycled, repurposed wood. The grain is beautiful. The corners are 1/4" box joints which are pinned with 1/8" dowels. I was playing with the box joint jig and ended up with four pieces that created an open cube about 2 1/4" x 2 1/4" x 3". So I put a floor in it and it ended up being a pencil box. It is headed off to my Wife's classroom. Most guys give their wives flowers, jewelry, candy (not always a good idea), and manufactured cards for their birthdays. I give my Wife homemade cards and homemade presents. This is this year's present. I always wanted a "Yard Checkers Set." First, I am pretty good at checkers. (Who isn't?) Kids can play checkers rather well. Granddaughter? Checker games are usually a lot shorter than chess games. And (Lesson learned) twenty-four checkers store in a lot smaller space than thirty-two chessmen. The pavers are 12" x 12". The checkers are all from 3/4" plywood and are 12" in diameter. Each checker has a 2" hole in the center for picking up and moving with a bent "weeder" stick. The checkers "nest" or interlock for making kings and storage with the cleats and the play is enough to work without getting sloppy. I finished the checkers with Gloss Black and Gloss Red. The wood is a mix of shop leftovers, some were bare, some had been stained, some had been clear coated, and all had been sanded for this project. When I picked up the finish coat paints I thought I had primer. Ooops. And the store is 14 miles away so..... Brush on. Three coats of each got the job done. Today, November 2, 2015, while mourning the end of the National League's chances for a world series, the first Yard Checker Games were played. As stated elsewhere, I tend not to do Christmas shopping for gifts, I tend to do shopping for tools I may need to make my gifts. 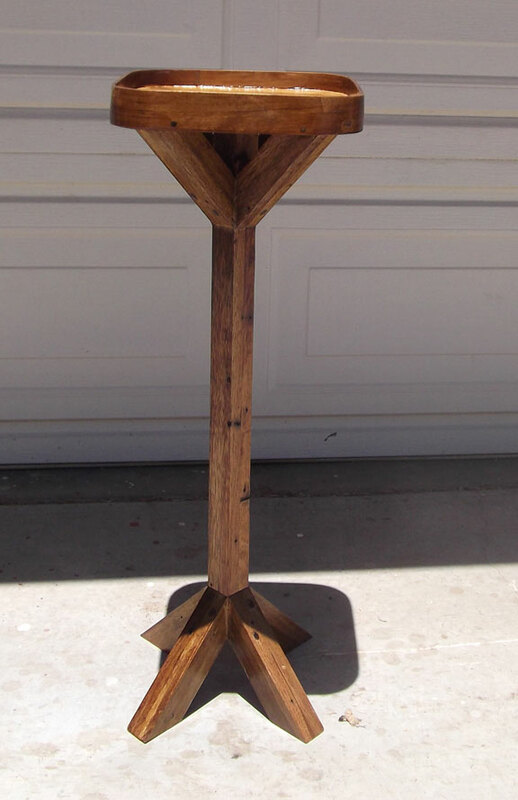 For Christmas 2015 I decided to make Calendar Stands out of recycled, repurposed wood. These went to my Wife and two of my Daughters who all work in schools. My third Daughter's present is still in work due to physical issues. The horizontal supports on the front are dadoed to hold the panels and the back has spaces for storing the panels for the months and the days of the week. The smaller number panels are stored in the top. With twelve months and seven days of the week I double-sided them so there are six for months and four for days of the weeks - I added "Holiday" to fill the last day of the week spot. There are twelve individual number, smaller, panels - two 1s, two 2s, and one for each of the rest of the numbers due to the 11th and 22nd of the month. I double-sided these with random numbers in case one or more "travel" along the way. For the stencilled letters I tried an enamel paint and found it ran or bleed badly when covered with MinWax's Polyurethane in gloss. The acrylic paints from my Testor's model painting supplies worked well so I consumed a fair amount painting the panels. The only true annoyance was due to the auto accident in May 2013, I could only paint two or three large panels a day before my arm and hand started shaking to the point I could not paint within the stenciling lines. With sixty large panel sides and seventy-two smaller number panel sides, the lettering took a LONG time. The last coats of finish went on Christmas Eve. There was still a bleeding issue with the birch plywood which was the front of the stand with both the lettering paint and Sharpie ink. The solution here may be apply one coat of finish, buff sand it, then letter it and apply additional coats of finish with buff sanding between coats. The gold and silver kind of blended into some of the coloring of some of the woods so I used a Sharpie to outline those letters. On this particular calendar stand the back is two pieces of plywood, most likely red oak, joined with wood biscuits - repurposed / recycled wood. With our Granddaughter's first Christmas there will be memories. Her Mom's (our Daughter) favorite wood is Purple Heart and I had some left over from another project so ... Purple Heart it was. The Min Wax Polyurethane kind of took some of the beauty away from the frame in the photo. It is more evident when you see the frame in person. The height is just over nine inches with a width of just over seven inches. The picture "window" is about three inches by three inches. There are several special photos from Christmas Day that are candidates for placement. Lillian and her dog Kidji probably lead the list. The back is drilled for pegs so it stands on a counter or hangs on a nail. FUN project. The stenciling on this project was "INTERESTING." We found a "blotting" stencil at JoAnn's Fabrics and I followed the instructions. This process requires long wait times between adjacent letters and cleaning of the stencil after every letter. The key may be apply the first coat of finish first so bleeds and runs can be corrected. I love working in wood, or metal, or dirt, or a lot of other things. I love making stuff for other people, particularly children in the hospital. As a child I spent a lot of time in the hospital and it was not a nice or friendly place. I am also trying to get the detailed coordination back into my hands after the auto accident which the only fault of mine was being there - rear-ended by someone changing the music on their smart phone and driven head-on into a police motorcycle. I was stopped to make a turn and they were both doing 55 MPH plus. More than 32 months and still fighting recovery. 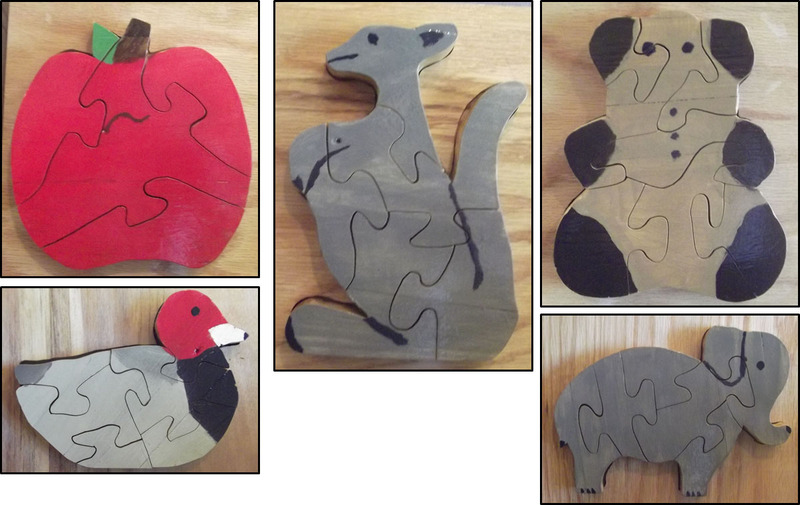 These are the first jigsaw puzzles I have made in probably 50 years or more. The jigsaw on the Shopsmith is amazing for this. Using a spiral cut blade I can change the blade speed to just about anything to handle the changing densities of the woods. The kerf, saw cut is probably 1/32 of an inch so the fit is fairly tight. These are two layers of wood of various types laid at 90 degrees to each other and then glued together with exterior glue. The back side of the puzzles is (in my opinion) more beautiful than the front side.) The color paint is acrylic as enamel paint ran terribly with the Min Wax Polyurethane Clear Coat. All sides are sanded smooth after each coat until the coats no longer raised the grain so the pieces are pretty darn smooth. If you have not figured it out, upper left and clockwise, a red apple, a kangaroo, a teddy bear, a female Asian elephant - no tusks - all African elephants have tusks, and a red head duck. From the upper left corner, a little Scottie terrier of some kind. 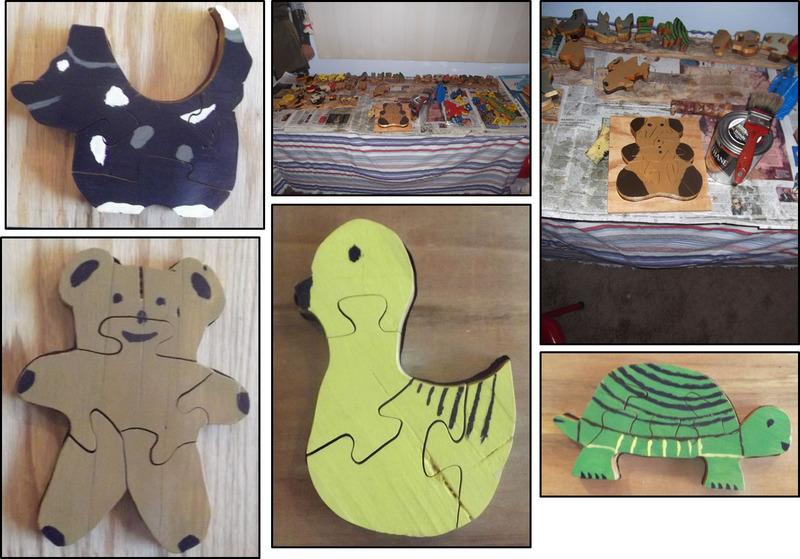 The cut lines do not show up, there are five pieces to this guy, some of the puzzle pieces in the process of being painted - two photos, a turtle, a yellow duck, and another teddy bear. These are typical backsides of the puzzles. The wood is all recovered / repurposed. The variety is beautiful - to some of us. As most of the Daughters moved out of the house guest spaces opened up and stood idle too long. Setting beds up, taking them down, storing them etc. got to be bothersome. So ... a Murphy Bed with a full sized mattress. The hardware kit is from Create-A-Bed through Rockler Woodworking and Hardware. The materials are high quality. In my opinion the cut sheet plots need some work. I provided my comments to Create-A-Bed and got no feedback. I did get very good responses to a couple of building technique questions over the phone. This project was in work from February 2016 until June 28, 2016. Kind of limited in working on some items due to the shoulder / arm issues. When working with 3/4" Birch plywood I needed help moving and cutting the pieces. During assembly kind of had to wait for help. Dropped one expensive sheet of Birch and did enough damage a replacement was needed. Lesson learned - get help. While the cabinet is Birch, the trim is clear pine. The profiles on the drop section of the bed required 64 pieces of trim with 45 degree angles at each end - 128 miters! All hand cut. See the section on Bad Axe Tool Works - A Veteran owned business for this. Having had issues moving and working with the pieces I expected the total assembly to be TOO HEAVY. Not so. The mattress is a bit light so it needs ballast. Deployment and stowage is easy. Kind of cool. Pillows cannot stay on the bed when stowed so they go to the top. Seems you cannot have everything. Sixty-four pieces of trim with a 45 degree cut at each end. They came together VERY nicely. The Bad Axe Tool Works saw and Bad Axe Bench Hook Sets worked fantastic. Click the hyper link text to see the Bad Axe Tool Works items. More repurposed wood work. For the three vertical pieces these are three layers of planed wood glued together. For the slider bars it is only two. The slider moves very nicely across the full range of the rack so books can be kept vertical. This was a lot of work for the mortising machine. The end pieces are perpendicular to the surface while the slider is mortised at 3 degrees. 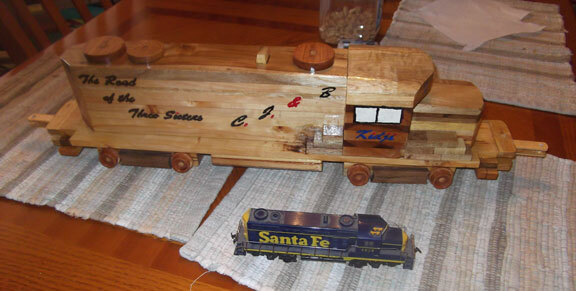 More repurposed wood projects. Little boxes to hold things are always needed. Pencils, pens, crayons, pins, drill bits, spices, whatever. I usually let wood pile up until it just needs to be consumed. These are the latest results. There are not nails or screws. Finger box joints with dowel pins all glued together. Then finished with one of several finished. 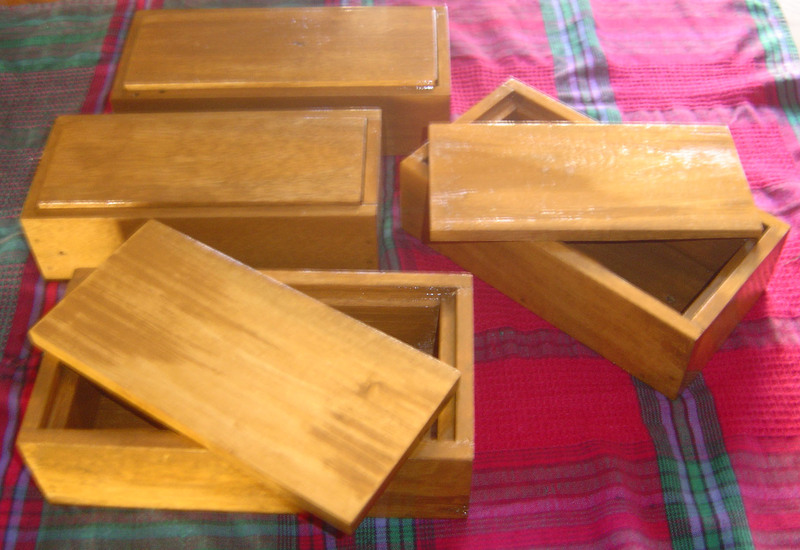 These are done in Danish Oil and then finished in clear Min Wax Polyurethane. Several people have asked about finishing small pieces like those for puzzles and how to hold them while drying. Here is what I did. I took scrap and and my pin gun and started zapping. The pins are so small they leave almost no detectable mark. And, if you want, you can slightly bend down the ones you do not need or want touching your work. For storage I simply flip two pieces facing each other and pile them up. For larger, heavier pieces I use the painting pyramids available for woodworking shops and big box stores. My Granddaughter is about eighteen months old so we need to start working on her Ph.D. (Piled higher and deeper.) These are about 1 1/4" cubes in a seven by seven matrix so there are (7 x 7 x 6) 294 faces. With upper and lower letters, punctuation marks, 0-9, math operatives, and spaces this should keep her busy for about fifteen minutes. The blocks are given about three coats of Min Wax Polyurethane with sandings between each coat to get them smooth. Then I use a stencil and start lettering outlines with a Sharpie. With a wide variety of craft paints the hand painting of the characters start. My VA and Navy medical team want me to work on hand-to-eye coordination and this is about as frustrating as I can get. The smooth finish allows mistakes to be wiped off very easily, I have a roll of paper towels next to my paints and I use a fair amount of them. All characters need at least two coats and some need three or four. After that is is another three or more coats of Min Wax Polyurethane with sandings between each coat. A long time ago I learned to hate end grain in crafts. Still fighting end grain. The frame is intentionally slightly larger than the matrix so blocks can easily be moved. The object of the frame is to try to keep them from being lost. Contrary to the letter blocks you buy at the store, you can make sentences and do math as well as build and pile them up. Most of the store sets are bare wood with letters on two or three sides and not enough options to do anything but learn the alphabet. We moved into this house, new, back in 1987. The mailbox rail at that time was showing some wear and tear and we mounted our mailbox to it. Several years ago it was really showing its age and I discussed with a few neighbors the big "cluster box" concept. The discussion ended quickly on a negative note. Earlier this year the mailbox rail had deteriorated to the point that we were catching our mail when we opened the door. Here are a couple of before photographs. The wood was rotten and split pretty bad. In the lower left corner you can see a temporary brace I put in to slow the progression to the ground. Appreciate that this is twenty-eight plus years of rain, sun, and wind in our desert climate so it lasted far longer than expected. Today, September 28, 2016, it was only 93 degrees for a high. About average. The line of twenty-eight mailboxes. You can see the numerous temporary braces I put in to stop the progression to the ground. Because they are mailboxes the post office has to be involved and approve any changes. Because the mailboxes are personal, private property, I had to get twenty-eight people to agree. Five trips to the post office, several phone conversations with postal inspectors, three mailings to non-responsive neighbors, and several walks of our 1/2 square mile neighborhood everything was in place. FINALLY. Construction was modular for a thirty-two foot long top rail section with 2x6 supports all mounted on 4x6 verticals. All pressure treated lumber and galvanized hardware. No nails, all predrilled holes. All mailboxes are on new, pressure treated lumber base plates and mounted with lag screws from underneath. The faces are within 1/4" of a left to right reference line. The gap between the second and third mailbox from right to left, a bit backwards, separates the mailboxes by streets. We have three street names on the rail. Some individuals took the opportunity to replace old mailboxes. I stencilled them - the "125" on the first mailbox is an example. Four of us, Kirk, Matt, Jeff, and myself did the installation, any more would have been in the way. We started about 7:00 AM Saturday, September 24, 2016, and had most of the mailboxes in place for mail delivery by 1:30 PM that day. I finished the small details on Sunday such as painting over the hardware and construction hits. On Monday I smoothed the dirt from the holes and called the job complete. Final cost was about $20 per person, times 28 people - $560. We live about thirty miles northeast of downtown San Diego, California about 1,600 feet above sea level. Our region is defined as desert and our annual, non-drought year rain fall is 9-11 inches. We are in our fifth consecutive year of drought conditions so our annual rain fall averages, which are updated on a yearly / ten-year average are coming down but I hold to the 100-year average of 9-11 inches. Having lived here 28 years now we have been in drought years 23. Hmmm. I think they need to rethink "drought years." The area is basically decomposed granite, DG, which has no nutritional value at all, basically crushed rock which hard packs to the point that digging post holes is a task beyond most homeowners. The five, eighteen-inch-deep holes for the mailbox rail took over four hours with a power auger. If it is growing around here it is either planted in imported dirt and soil, then irrigated or a desert plant. Due to the non-absorption property of DG, almost all of our rainfall, when it comes, runs downhill. In 2015 we received a fluke rainstorm during monsoon season and got more than 5" of rain in less than 36 hours. And we were still under 9" for the year. Directing and controlling water is actually a BIG issue. An acre is 43,560 square feet and most of the lots in our area are basic acre lots. If we were to get one inch of rain, that is 3,630 cubic feet of water or 27,152.4 gallons of water weighing 226,179.5 pounds. And not much soaks in so it is moving. Fortunately, we usually get nice light rains and it moves nicely DOWNHILL. I live on the side of a hill and before my house floods my neighbor will be under twelve feet of water. July 2015 was not a nice, light rain. However, sand bags are always around. Ever try to fill a sand bag? Someone holds it and gets dust and dirt thrown in their face while someone else shovels and smacks the holder's hands. Preparing for the winter rains, expecting another dry winter, I got tired of dirt face. So I made a one-man sand bag filler from scrap sitting around the house. Several sand bags were filled and it works GREAT!!! There are three large clips at the bottom of the upside-down roof furnace flashing. The frame is old wood that was destined for neighbors' desert camp fires but never went. The height allows the bags to sit on the ground while the clips holds the top of the bags to the flashing without folding the material. Two test bags worked great. If it works out, one person can attach the bag, then tie off the previously filled bag while the filler fills the new bag. Then the new bag will be full and ready for replacement. What fun. I have unsuccessfully tried the Huck Finn / Tom Sawyer "paint the fence" tactic on people in the past. FYI: One third of the El Ninos (Little Boys) which should be wet are dry and one third of the La Ninas (Little Girls) which should be dry are wet. This last fall / winter, 2015-2016, we were supposed to have a Super El Nino and get tons of water in Southern California. Northern California, Oregon, and Washington state got slammed and those of us in Southern California were left high and dry for the most part. El Ninos and La Ninas are based on Pacific Ocean temperatures just north of the equator. Warmer than average El Nino and expect water, cooler than average La Nina and expect dry weather. Some photos of our July 2015 fun are provided. This swale is about eighteen inches wide and a foot deep. It is overflowing in a torrent. Air is pretty common unless you are somewhere like outer space, which is actually micro atmosphere not a vacuum, the top of Himalayas, or under water. However, when you need air in a tire it can be pretty rare too due to the compression factor. We have a nice sized air compressor in the workshop and a 10-gallon tote bottle that tours the neighborhood for low tires and such. The other day one of the neighbors was throwing out his little horsepower, 10-gallon Craftsman air compressor as it did not work anymore. The data plate says manufactured in 1994, so it is not that old. Mine says manufactured in 1985 and it runs like a champ, and I take care of it. This little compressor had sat outside since 2000, the air filter was broken off, the pressure sensing valve assembly was full of bugs, and the tank had about two quarts of gunk in it. The plastic protective housing over the motor and compressor was broken, and the attached air hose was dry rotted. Hoping to do something with it, I took it home and spent about four hours taking it apart, cleaning it up, and putting it back together again. It would pressurize to about 80 PSI vs. the target of 120, and just run. Both the intake and compression side of the reed valves were badly pitted and repair was out of the question. The cylinder walls were scored from unfiltered air and that dirt destroyed the piston ring. Parts check showed over $100 in parts for a compressor worth about $50 at this point. So, Plan B. Took it all apart, wire brushed the tank, and the handle. Went through the Craftsman red with the Craftsman decals and found the original manufacturer's orange and his decals. Sand blasted the badly rusted axle bolts which would hardly let the wheels turn. Then purchased about $30 in new plumbing and started reassembly as a wheeled tote bottle. The tank is Rust-Oleum Painter's Touch Burgundy spray paint. Why? Because I had the can in the shop. The handle is Rust-Oleum Painter's Touch Ultra Cover 2x Gloss Black spray paint. Why? Because I had the can in the shop. Both are now empty. With the platform for the compressor and motor annoying me I turned it into a tool tray just to cover it up. All with leftover wood from other projects or items. The end result is a 10-gallon wheeled tote bottle that will hold 120 PSI air from the big compressor that you can walk down the street with like a puppy. Our other tote bottle does not have wheels and it fits in the trunk just fine. So, success, invested about $30 and about eight hours to create a tote bottle I could have bought brand new for $40. That is DIY logic and economics. My Daughter has "Hongerig Geholpen" (Hungry Aide in Dutch), a skeleton, in her classroom as a teaching aid. As a teacher of a state approved course she can purchase and possess human bones and organs for her class. High quality skeletons come with cheap bases and Hongerig's plastic base broke. So the problem got transferred to her husband and Dad. This base is about 24" in diameter with five 2 7/8" diameter full castering and an option to mount Hongerig in the center or slightly offset. The default is offset since Hongerig had an off center mass and this position increases stability. The wood is Birch plywood finished in Min Wax Natural Cherry Polyshade. One of my acquaintances from the Internet, who has been providing me a lot of information I need, needed a Nativity Scene Stable. 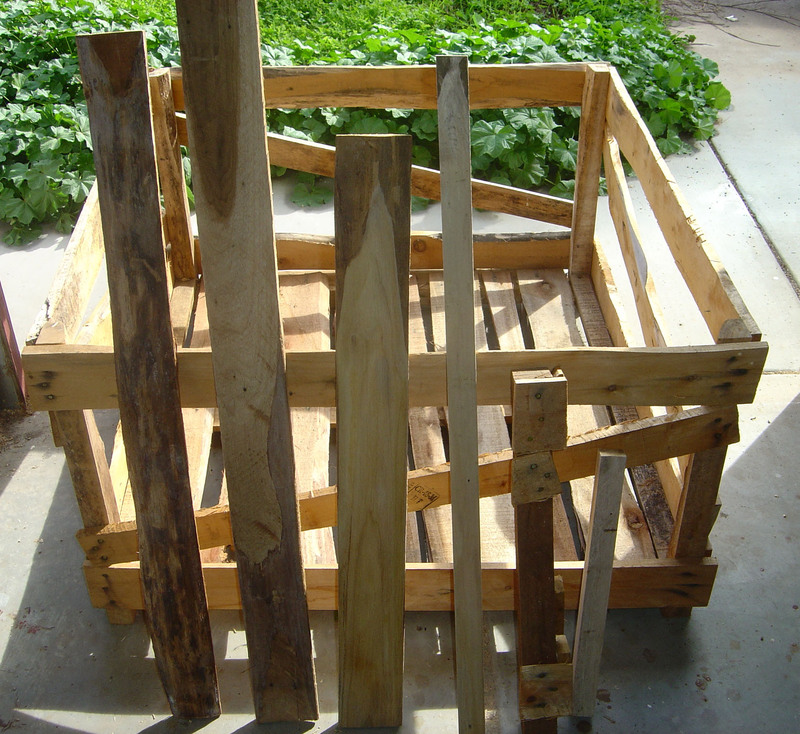 So down to the workshop with the recycled / repurposed wood. 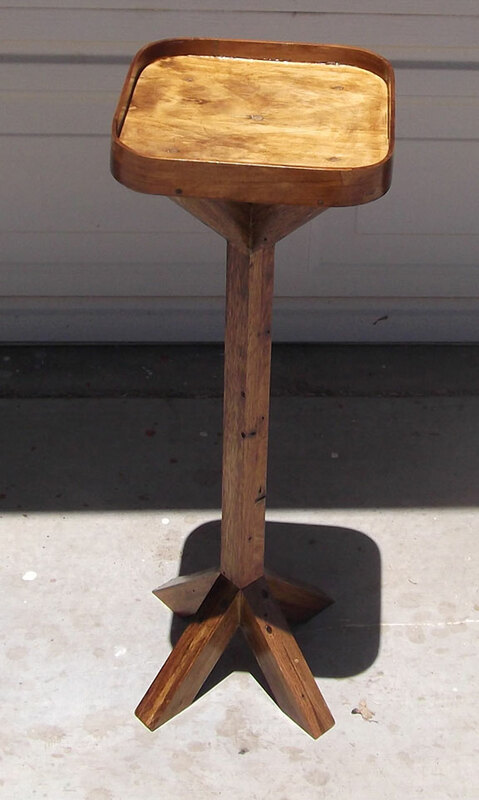 It is approximately 9 1/2" wide and tall at the back, approximately 12" wide and tall at the front. It snaps together with color-coded locators so it lays flat when not in use. Slatted so it is not dark. Fun project. This project has been in work since before Halloween 2016 and was finished today, Tuesday, December 06, 2016. Two will hopefully be delivered Friday, December 9, 2016, as complete. One will go to the Armed Services YMCA at the Naval Medical Center San Diego, one will go the VA Medical Center San Diego. I will take the third one in during my next operation at VA MC SD scheduled for early 2017 and leave it behind when I "check out." These are chess / checker / backgammon / ace-deuce / (Acey-deucy if you search the Internet) sets. I talked to the VA Medical Center San Diego and U.S. Navy Medical Center San Diego and neither was "friendly" to kind of large rigid, wooden boards with drawers underneath them to hold the pieces. So, how about a reversal bag with a chess / checker layout on one side and a backgammon / ace-deuce layout on the other? Not a problem there. Two of the bags are 18" x 24" while the other is about 20" square. All are sewn patchwork type squares and triangles. For the chess / checker boards that means sewing 32 red squares on blue denim. For the backgammon / ace-deuce boards that means sewing 12 light triangles and 12 dark triangles. Then the zippers are sewn in followed by sewing the panels into sealable bags. I intentionally used contrasting thread for color (and because it was what I had in the sewing kit). All patches are sewn on with zig-zag stitches for texture and to seal down the edges. Sitting on the carpeted floor the bag boards did not lay real flat but they do on the table. The chessmen are turned out of reused / recycled / repurposed wood utilizing the lathe capability of my Shopsmiths. Once I started I realized I could not do many thank you auto accident and the solution was the lathe duplicator which provides a table for the cutting tool to rest on so I do not have to support it. Accents such as the gash on the rooks and bishops were done on the band saw. The knights were free-hand cut on the band saw. All the dark chessmen have red accents or dots on the tops while all light chessmen have blue dots. The kings are accented with gold while the queens are accented with silver in their "crowns." With the use of several calipers the result is no two men are exactly the same while the pawns are closest to being the same. There is an extra pawn and an extra piece, a dunderhead, which is basically a base and staff which can be titled any piece for each color with each set since we know there will be pieces lost. There are 16 checkers / backgammon / ace-deuce pieces of each color. Twelve of each color are needed for checkers and fifteen of each color are needed for backgammon / ace-deuce so I have provided one extra because we know there will be losses. Each black one has a red squiggle while each red one has a blue squiggle to provide visual distinction on the board. The red and black checker pieces are Rust-Oleum Painter's Touch Ultra Cover Multi-Purpose Gloss Brush-On Paint which is soap and water clean-up. The chessmen are finished with Brand X Polyshade and Polyurethane. A local teachers store has large, 3/4" cube dice, and I will pick those up on my trip to the ophthalmologist on Friday, December 9, 2016. Maybe I will try making some out of leftover wood. She has magnetic letters, numbers, figures, and gears. Who would have thought that some design engineer would invent stainless steel appliances and generate a need for magnetic boards outside the kitchen? Granddaughter comes over here and spends a lot of time moving magnets around our appliances and then gets frustrated at her house when they do not stick to their appliances. The base metal is leftover 24 gauge steel measuring 24" x 24". I applied several coats of Rust-Oleum Oil Rubbed Bronze to both sides of the sheet. Then masked for spraying with Rust-Oleum Gloss Red, Gloss Blue, and Gloss Silver the sides to create the backgammon / ace-deuce side and the checker / chess side. There are three taping sessions due to the colors and just under two full rolls of painter's tape was consumed. The frame is wood recovered from the bed foundation that had no purpose in life after the Murphy bed was put in place. It is finished with four coats of Min Wax Poly-Shade Gloss Pecan leftovers from other projects. The checkers are cut from 1" dowel rods and brush painted with several coats of Rust-Oleum Gloss Red and Gloss Black with an arts paint "squiggle" to make them more visually distinct. The chessmen are turned from repurposed wood from the commercial greenhouse then finished with Min Wax Birch or Pecan Polyshade. Since it does raise the grain, there are four coats on them. The kings have gold "lids" while the queens have silver "lids" to help distinguish them apart. All have a colored dot on their tops or strokes to better identify them. They will also be pieces for a game box I am building. I tried the gears and got them all to work. The neighborhood kids have the fidget toys. They are in the classrooms of my Wife's grammar school AND IN MY COLLEGE CLASSROOM. They are annoying to some of us. The neighbor dropped one and it broke. It will not glue or heat weld. So pull out the wood working tools and have fun. The result actually works pretty darn well. I expect it to break the first time it hits the ground. However, it was fun making it. One of the neighborhood kids wanted to make a Father's Day present with the repurposed wood and he had an idea. We modified it a bit to make it possible. His has been in work for three weeks and if we are lucky it will be ready for Father's Day 2025. I liked the idea we ended up with and decided to make some for the Family. The wood was jointed to make one side flat and then planed to standardize the thickness. Off to the table saw to make them rectangular. Once glued together the cleats are made and a dado blade is used to they are nested. The letters are outlined with a stencil since the wood is just over a quarter inch thick. The symbols are outlined and the rest is painted free hand - and it shows. The lettering and symbols are in acrylic arts paints and the plaques are finished in Rust-Oleum Gloss Varathane. Joyce is a big Chicago White Sox fan. They gave her tickets for perfect attendance while in grammar school. Her Father was in their farm system before being called up for WWII. We are both from the south side of Chicago and never lived more than five miles apart before we met. This is her Chicago White Sox plaque. It is about 29" wide. I am a Chicago Cubs fan. Not a big baseball fan or sports fan. The Cubs had better commercials and that was cool. Our oldest Daughter was born in Japan during our first tour there. She has not spent a lot of time in Chicago but she is a big Chicago Bears fan. Our youngest Daughter was born in Japan on our second tour there. San Diego became our "hometown" about the time she started school. Her favorite teams include the San Diego Padres. Our Granddaughter is growing up. A process that progresses every day. Amazing to watch. I want her to be one of the smartest, most educated kids around. So I provide her with a lot of toys and stuff that have mental growth issues "under" them. This is the latest piece of material. The easel is double-sided. Both working areas have trays for items. The easel does fold up a bit, not completely flat. There are spaces between the legs to reduce the pinch points. The working surfaces adjust up in height at 3" increments so as she grows the working surfaces can be easily raised. There are "retention chains" near the top so the legs will not split on a sleek surface. The front side is a drawing easel in which the paper is a continuous roll from bottom to top so it is logically progressive. It rolls from one roll onto a take-up roll. The backside is actually two slide in panels, both have two "active" sides. One panel is a chalkboard on one side and a dry-wipe board on the other. The other slide in panel is a magnetic checker / chess board on one side and a magnetic backgammon / ace/deuce board on the other other. The one that is not in use is stored on the inside of the easel. In the earlier photo the magnetic board is stored and the chalkboard is in use. Joyce saw a picture of something like these somewhere and the request came. 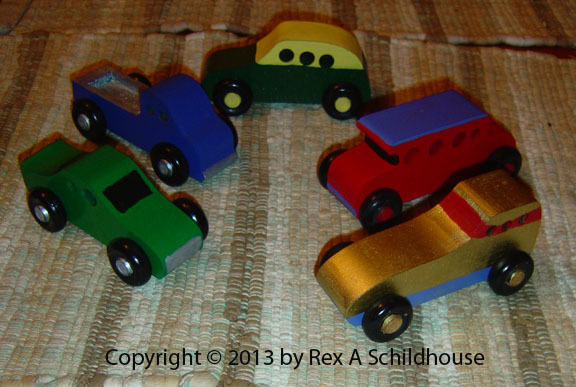 These are made out of nothing but scrap wood that was laying around the workshop. Chances of them ever getting real snow? Pretty slim. 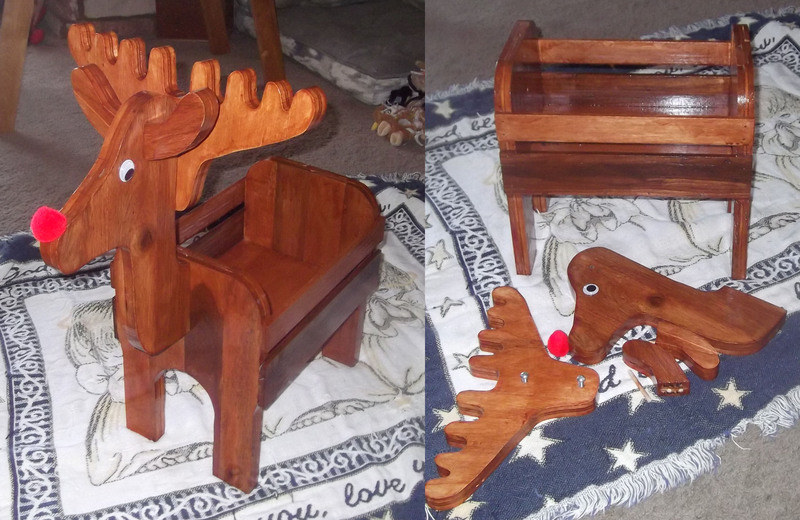 Many years ago for many years we had a Reindeer Stand that was actually pretty annoying. About half the size of this one but it was nailed and glued together so, when packing up Christmas stuff at the end of the season, it was always something that had to be worked around. Joyce wanted a replacement. I drew several sets of antlers and this is the size she wanted and that drove the rest of the reindeer. The reindeer is made out of repurposed wood that has been jointed and planed to equal thickness, then glued to 1/4" scrap plywood. The head, antlers, and ears are all detachable so they are the only things that will go into seasonal storage. The body will remain out as a storage point, most likely for crayons for the easel. This guy is 24" high at the top of his antlers. His antlers are almost 15" across. His "storage bay" is about 9 1/2" wide and 12" long. Trivia: Both males and female reindeer grow antlers, but at different times. The males grow and shed them earlier than the females. The males have antlers from February to November while the females have antlers from May until the following April time frame. This issue, along with the facts that Santa's reindeer are miniature in size and can fly, makes Santa's reindeer a special breed. Model railroads have an issue and one of them is size and location. So, I built a fold-down O Gauge model railroad board. Several organizations, including Lionel when I contacted them, told me it could not be done without "drop-in track inserts." I disagree and had done it with an HO set while on active duty. Here are the results. 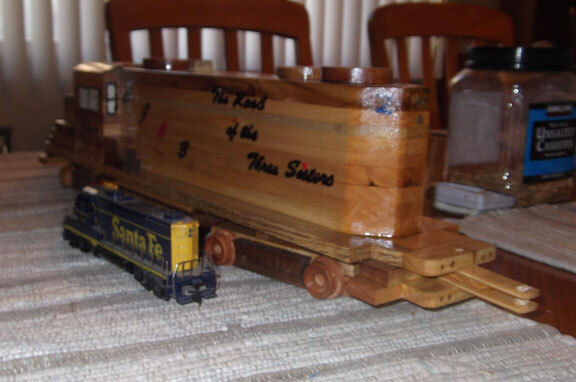 The drawers hold all of the rolling stock and scenery. The top drawer on the control side has the transformer mounted and all of the switch controls. From folded down and moveable to up and running - my track in the video was dirty so it was not cooperating, is less than three minutes. You Tube link to the video to see the board go up and operate in less than five minutes. It seems I am always looking for a space to put stuff and have little ability to work outside the shop on the entry concrete. I was also looking for a larger router table surface. Under this 26" x 48" table made of two 1/2" pieces of birch plywood is a Husky folding work and router table. I have used it several times now, a bit heavy to move but stable and wide. Only wish it was about 15" higher so I could sit on my stool and work on it. Can't have everything. The top removes pretty easily to gain access to the router insert. I am not sure where I got this piece of wood, it was sitting in the workshop and I decided to use it. It was about 3/4" thick, about 3' long, and about 5" wide. I resawed some of the leftovers to make the panel top. They are finished with clear, gloss Varathane. The corners are 45s cut on my Delta chop saw and they match perfectly. Then I dowel pinned all corners for additional strength. The lid sits inside and is raised by pressing one side of the top. Narra wood is native to Africa and Asia. Beautiful mix of reds, light tans, and yellows. One of my neighbors dropped this off a while back. A gun cabinet that had seen better days. With a spray painted finish there were tons of can rings, pealing paint, the fixtures were rusted. I do not have any guns to put in it so, what do I do with it? I spent about 15 hours sanding, sandblasting, and painting it with Min Wax PolyShade Gloss Pecan and it came out pretty nice. I made the gun rack portion removal and intend to drill the sides for shelves and turn it into a curio cabinet. There is a really nice etched glass wildlife scene on the door. With numerous Sudoku boards made I thought I was done with them. Cleaning out the workshop I found one more set of men and a partially finished board. So, finish the job. The ruler, for sizing, is just over 7" long. Another find in the workshop during clean-up. These were started for something some time ago. They are about10" x 10" x 1 1/2", Finished with Min Wax Polyshade in Natural Cherry Gloss. No idea why they were started. Now they are finished. When the Granddaughter comes over and plays, we are on the floor and it is flat out painful. (Stupid no fault of mine auto accident issue.) And, we set up the little battery operated railroad set on the carpet and, while it worked "okay," it had some issues due to the carpet texture. So.... Off to the workshop. The play table is about 39 1/2" wide by 49 1/2" long, and, at this moment, about 17 1/2" high. I modified the folding leg assemblies so that you did not have to totally remove them to change the length of the legs and mounted them so that they could be VERY long. On the table surface, which is sized for that battery operated railroad set, there is backgammon / Ace-Duece layout and a checker / chess board as well as A through Z and 0 through 9. Fun and learning challenges. There are five coats of clear gloss Min Wax Polyurethane after the hand painting or spray painting of the boards, letters, and numbers. The star is actually textured, "sparkle" paint. Lillian finished the last leg installation by tightening the last mounting bolt. Not bad for less than three years old. So Lillian and I are playing on the table and we are both sitting on the stools, which drove the initial height. I asked her how the table was. She padded it with an open palm several times, looked at me with a smile and said "Perfect." Kind of makes having Granddaughters and a workshop worth while. Video of Lillian and Granddad at the new play table. With the complications and after effects of the stupid ("I wasn't text! I was changing my music!") auto accident the medical team wants me to keep working on trying to get precision back into my right side. I love to draw even though I have little talent in that arena. I hate digging through the pencils and supplies looking for a particular pencil. 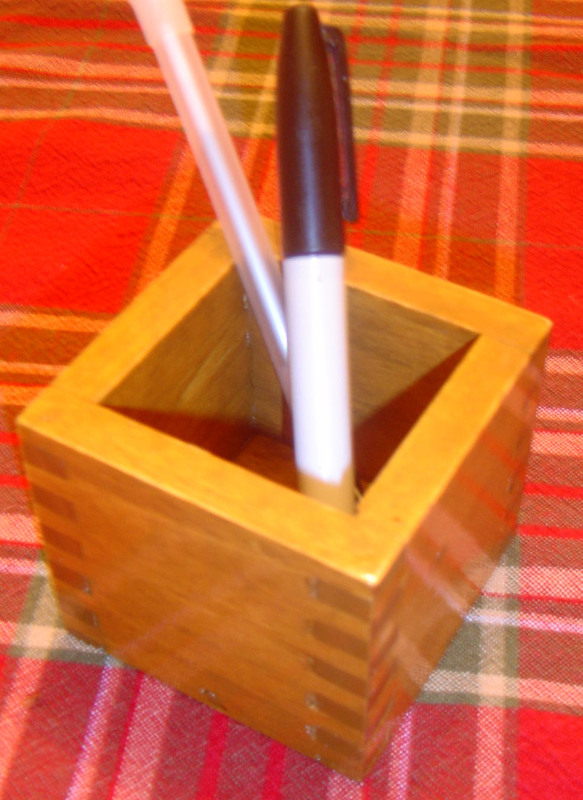 So, make a pencil tray. And it works really nice. It also holds the shavings from sharpening which is a feature Joyce likes. These pencils and materials were Christmas presents in 2017. The drawing books and such are SUPER! The calipers, add-ons, are for scaling. Joyce is really into Harry Potter and everything that goes with it. Not bad. She gets her students to READ. So, how can it be too bad? 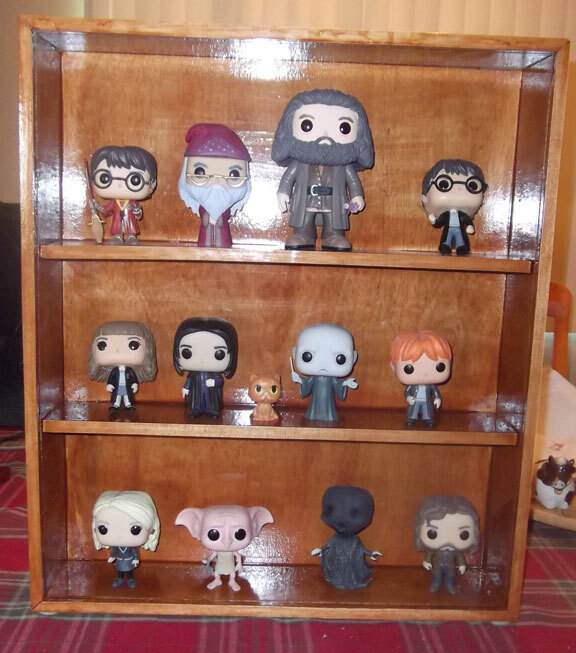 She has Harry Potter stuff all over her room and added these "interesting" creature renditions to her ornamentation. And one of them actually got up and walked away. So I was asked to make a confining display case. The top is removable and held in place with four screws. The front is covered with Optix acrylic sheet. I hope that they do not use magic on it to exit the case. Of more fun, Rubeus Hagrid's umbrella broke somewhere along the way. So, with some small drill bits and some welding wire, fixed that too. Why couldn't he just "presto" it back together? Hermione does it to Harry's glasses numerous times in the eight movies. Poor Harry, just like ET, fell over when the flash went off. Okay. Okay. I have some issues. I know that. I love trains. My favorite is the Electro Motive Division's GP-7 / 9 series often referred to as "The Jeep-7" or "The Jeep-9." Why? Because it was acquired as a Christmas present for me, not shared, and it was actually bought at a sale in the Pullman Car Company's old warehouse in "Pullman City" Chicago when I was about 9 years old. Still have it and it still runs. However, I love trains. PERIOD. And the Disneyland trains are absolutely amazing. Real, honest operating steam engines. Not shells with internal combustion engines hidden inside or with concealed electric motors. Joyce and I were at the San Diego Model Railroad Museum in Balboa Park to see their model railroad. Pretty cool. In their bookstore I find Steve DeGaetano's awesome Welcome Aboard the Disneyland Railroad! (Get the collector's edition, I can tell you how to get an autographed copy.) That book inspired some more train activity and this project. 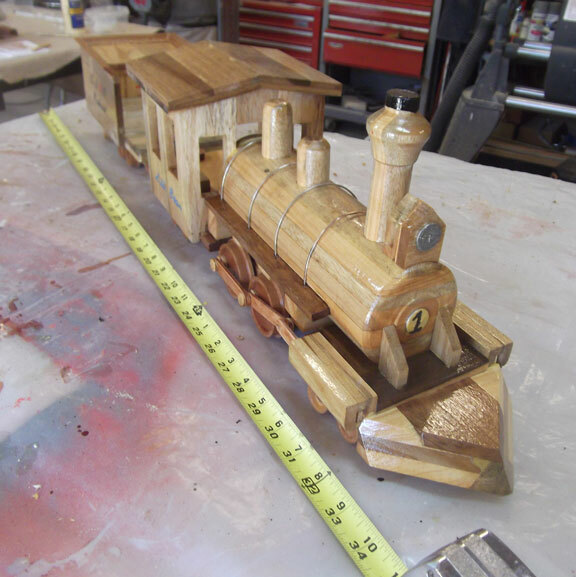 With the exception of some minor pieces such as the the piston rods, main rods, side rods, and "retaining washers" which are made from hobby plywood, the wheels, the axles, the washers used for the gauges, light and smokebox plate and the two screws this is all scrap, recovered wood. 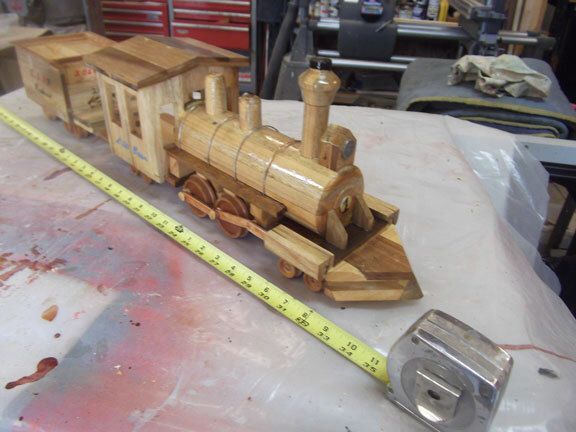 The locomotive has over 100 individual pieces of wood, the tender has more than 40 individual pieces of wood. The timing of the main, driver wheels is correct, the left is 90 degrees behind the right. The wheels all roll nicely and the trucks all track true. The locomotive and tender measure just under 33" long. The tape measure is pulled out to 36" as a reference. This is one BIG locomotive. Granddaughter Lillian has a nick name - Lilli Bean - so the locomotive and tender are the Lilli Bean and numbered 1. The railroad is C, J, and B Railroad named after my three Daughters, Cindi, Jenni, and Becki. It is The Road of the Three Sisters. 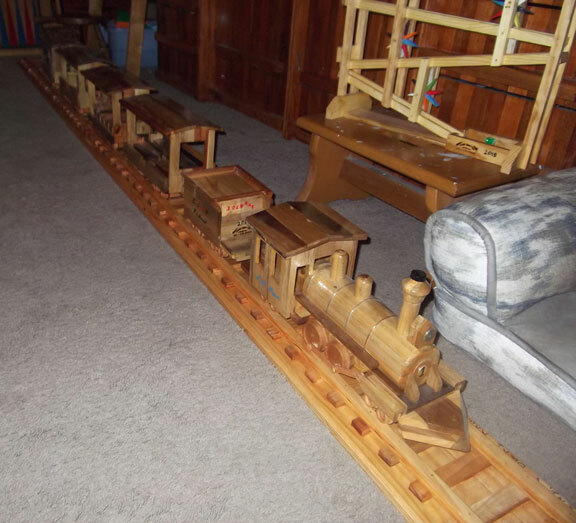 With over 200 hours invested the locomotive, tender, three passenger cars, one caboose, and an eleven foot long track the project is not quite complete. Lilli Bean, the person, has spent hours putting her little people on and taking them off, pulling the Lilli Bean train forward and pulling it back. There are a few refinements that need to be made. The gauge of the track gets a bit narrow at one point. 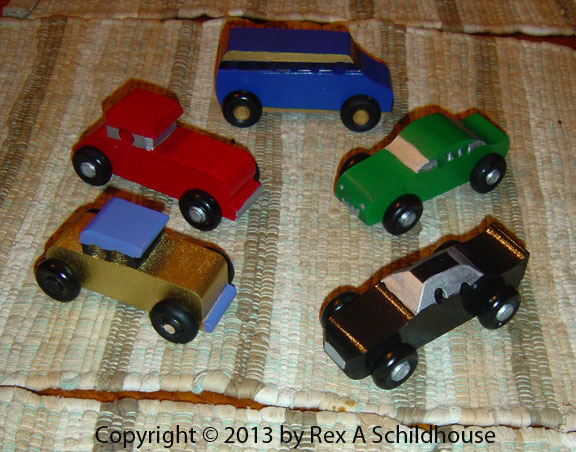 I need to redesign the couplers between the cars. Hyperlink to YouTube where Granddaughter is playing with the Lilli Bean Train. The Lilli Bean is sitting on the table saw, complete. The tape measure is pulled out and locked at 36". The left side of the Lilli Bean. I put a firebox door in, also a washer, and a few other washers as gauges on the backhead above the firebox. The tape measure is pulled out 36" and is set at the back of the tender. The track gauge, distance between the rails, is 3 3/4". I had some heavy brass wires so they become boiler bands. Just detail. The headlight and boiler plate are counter sunk washers with flat head screws holding them in place. Just little details. This is the Lilli Bean train on an eleven foot track. Like the Disneyland Trains it is designed to be boarded from the right side. The Lilli Bean Steam Locomotive and Tender. Just under 33" long and the pistons, drive rods, and side rods all work. This car, they are not in "Daughter Order," is the Jenni car and features side facing seating. This car is the Becki car and has forward facing seating. And Mom / Grandma brings up the rear as Joyce. The cupola in the caboose is accessible from inside the car. The Lilli Bean sitting on its eleven foot track. Note the easel in the upper left corner of the photo, which got extensive use this day, and the rolling thunderball toy by the locomotive. Doc Turpin, my chiropractor, brings his broken airplane over. It got knocked off the counter and was in several pieces. "Can you fix it?" Doc, it is wood. If I cannot fix it I can make a new one. It got fixed. Along the way numerous issues were resolved. The airplane was assembled with air driven wire staples - THAT WENT THROUGH THE WOOD. Snag hazard. Some pieces were not in their intended alignment. So it got fixed. At the same time his space heater has broken wheels. Quick fix, bolt it to a dolly. 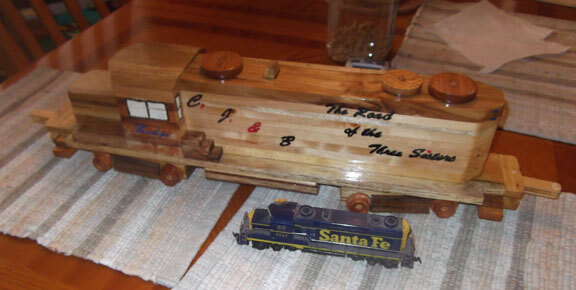 The C, J, and B Railroad and the Lilli Bean are inspired by Steve DeGaetano's Welcome Aboard the Disneyland Railroad. Fantastic book about Walt Disney and the Disneyland Railroad. (Get the Collector's Edition.) While I love steam engines the Electro Motive Division's (EMD) GP-7 road switcher, has deep spikes in my heart due to a Christmas present over 55 years ago. So, the C, J, and B got a GP-7 named Kidji as unit #2. 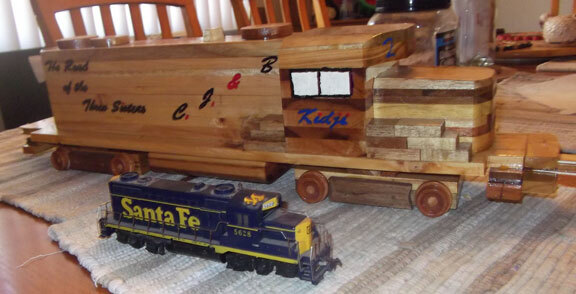 Built using mostly scrap / repurposed frame and pallet wood, the Kidji has over sixty pieces of wood. 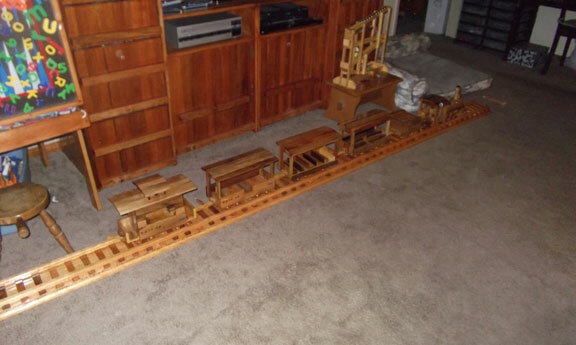 It fits the same 3 3/4" gauge track and has common couplers with the Lilli Bean consist. It measures over 23" long. Following the Mantua / Tyco HO model pretty close for structure, Granddaughter's little people were not going to fit in the engine. She is a bit disappointed. The Cindi, Jenni, and Becki Railroad is "The Road of the Three Sisters." Kidji is a shared family dog. Doc Turpin, my chiropractor, he gives me a call and asks if I can solve a problem. His remotes keep "traveling" to destinations unknown and he would like a small, 10" by 10" table that is about 27" high for his place. Okay Doc. Try this. Like many of my projects, it is made from repurposed frame / pallet wood. It is finished with Danish Oil and then clear MinWax gloss spar varnish - also leftovers. 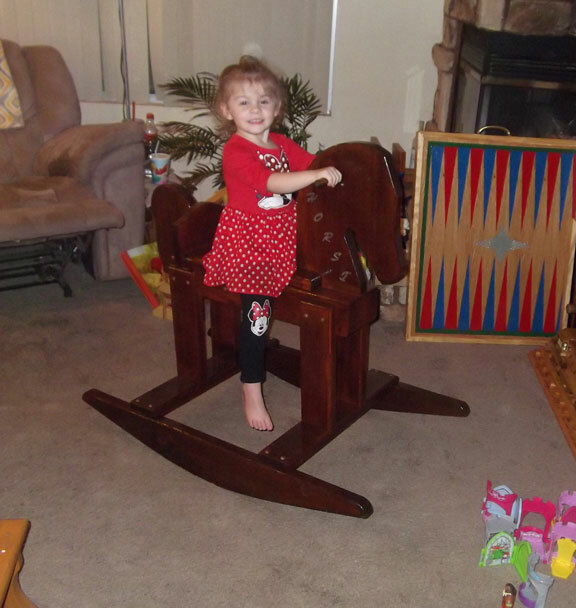 About 35 years ago this rocking horse was given to Lilli The Bean's Dad. It was sort of well built but not finished (painted) which opens it up to lots of issues including slivers. It sat outside for many years and went through the weather and a flood or two. Then it showed up at my workshop for repairs. Disassembly started out impressed with the construction. Then it turned sour. Evidently they ran out of button plugs and filled some holes with concrete anchors and then ground off the heads of the lag bolts. Now they cannot be removed without extensive damage. Easy-outs did not work. So, new holes, not a big deal and fill in the old ones - after forcing it apart. Sanding generated tons of dust and dirt. The wood ate three coats of MinWax PolyShade which went dark really quick due to the age and weathered condition of the wood. 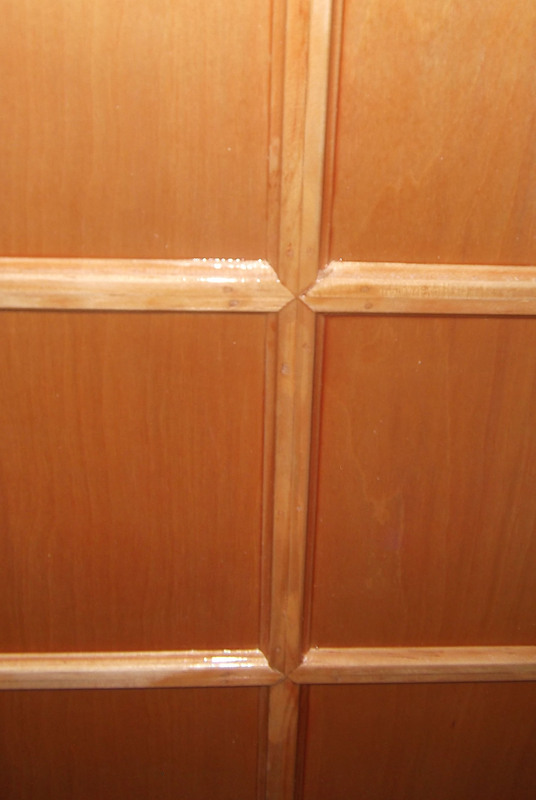 Then three coats of exterior clear gloss MinWax Spar Varnish to finish it off and seal it. Sealing it like this reduces the chances of slivers. The end product was a pretty nice horse that Granddaughter named "Horsi." A short video of Granddaughter's first ride.